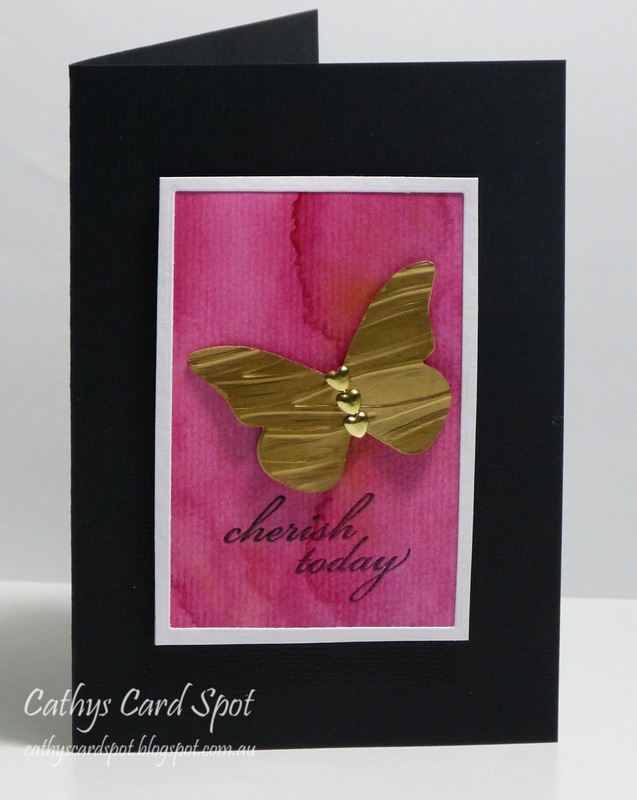 Cathy's Card Spot: Embossed acetate butterfly. 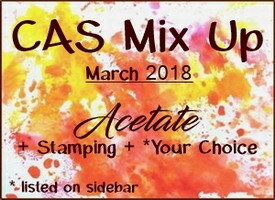 Hi everyone, I'm back with another guest designer card for the CAS Mix Up Card Challenge. Thanks to Loll, Bonnie and the team for inviting me to play along! My elements are acetate, stamping, diecutting, embossing, alcohol inks and watercolour! I've had this acetate butterfly sitting on my desk waiting for me to finish it! I had embossed it with a Stampin Up folder and then painted the back with gold mixative alcohol inks. It looked a bit scratchy so I added a gold paper layer behind it to even things out a little. I had one heart brad holding the acetate and paper together and hubby suggested I use 3. Glad he did lol! Tha background is a watercolour panel did a while ago using Kuretake Gansai and Finetec gold watercolour paints. I always make a few backgrounds in different colours while I have these paints out, makes the mess well wothwhile! The white frame is an offcut from another project. I trimmed it down as it was quite thick and looking at the pic it may not be quite even!! I've popped the panel up on fun foam to add some dimension, though it's a bit hard to see in the pic. 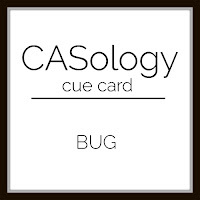 I'm also linking up to the challenge at CASology where the theme is bug! I think a butterfly is a glamourous bug! 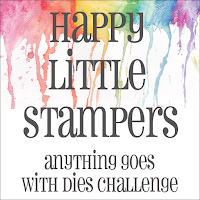 At Happy Little Stampers, it's anything goes with dies. 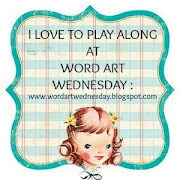 It's also anything goes with a scripture or uplifting message at Word Art Wednesday. At Cuttlebug Mania the challenge is to create a project with a Spring theme using a manual machine. Pink is definitely a spring colour and there are plenty of butterflies around then too! Stampin Up beautiful butterflies Bigz die; acetate; Stampin Up seaside embossing folder; gold mixative alcohol ink; scrap of gold paper; Kuretake Gansai and Finetec watercolour paint; Darkroom Door wings sentiment stamp; versafine ink & clear ep, fun foam. Your acetate gold butterfly is amazing and I love the pink background. Beautiful card, Cathy! I love the gold butterfly - what a great idea to dry emboss it! It adds so much dimension to the butterfly and catches light and shadow. The three heart brads look terrific. And such a pretty pink background. It's all very elegant-looking set against the black card base. Thank you so much for being our Guest Designer at CAS Mix Up! What a beautiful butterfly, Cathy! I love the embossing and elegant gold! He's perched on a gorgeous background made even more elegant with the black and white framing! Thanks so much for joining our team at CAS Mix Up this month! This is a beauty Cathy! That butterfly is gorgeous and the overall design is lovely. wow, the pink and gold really pop against the black. Awesome colour combo and gorgeous embossed butterfly. There's so much texture and dimesion with your acetate butterfly. Looooooooooove those colours Cathy. Beautiful card and that butterfly is amazing. You have a great hubby suggesting you use 3 heart brads. Finishes it of perfectly. That butterfly is a piece of art. Looks like a sculptured gold sheet, impressive. Love the colours and the design, simply stunning! Wow Cathy this is stunning love the butterfly, great to know that your hubby was able to help you out. Wow, that butterfly is just gorgeous. It looks fantastic against the pink background and the black card stock really adds impact. Wow! Your gold acetate butterfly and that wonderful background on a black card make a striking combination! Congrats on your GD! Absolutely stunning card! I love the contrast of the gold on top of that gorgeous pink! Thanks for playing along with CASology! What a perfect display of texture! Thanks fro playing along with us at CASology! Loving your CAS card and the pop of pink! Great way to use acetate and add some color! The layered paper isn't even noticeable, just the wow from the gold. Thanks for sharing at CASology this week! You know I loved this card 'cause I commented already but need to say again how awesome this butterfly card is. Such a gorgeous colour combination. With my Designer's hat on - thanks so much for sharing with us at HLS AG with Dies Challenge. Fabulous butterfly - another technique I must try! Dreamy in blue and yellow oxides. Alcohol inks, acetate and diecuts. Floral border with oxide inks. Horses and distress oxide inks.